David Barton on Real Life with Jack Hibbs: Did the University of Virginia Have Chaplains? At the University of Virginia there was no Christian curriculum and the school had no chaplain. Barton claims to have refuted Cornett by going to an original source. While it is true that the University of Virginia eventually created a chaplain position, this was not the case from the beginning of the school. Originally, UVA did not employ chaplains. Barton doesn’t tell you that scholars are concerned with the founding of the school and no academic historian I am aware of disputes that the school eventually added chaplains. Barton tells Jack Hibbs that the claim about chaplains and the UVA is made in connection to Jefferson (who died in 1826). In addition, Barton says he has a newspaper from “that era” which contains an ad by the chaplain of UVA. However, what Barton does not tell Jack Hibbs is that Jefferson was long dead before that newspaper article was published in 1837. By not placing the events in proper context, Barton misleads the audience to think the existence of chaplains at UVA came when Thomas Jefferson was alive. Not so. The claim about chaplains at UVA is also in Barton’s pulled-from-print book The Jefferson Lies and was one Michael Coulter and I addressed in our book Getting Jefferson Right: Fact Checking Claims about Our Third President. To fully address Barton’s claim and our response to it, I have taken that section from our work on the 2nd edition of the book and made it into a pdf file for review. I have indulged more particularly the hope, that provision for religious instruction and observances among the Students, would be made by themselves or their Parents & Guardians, each contributing to a fund to be applied, in remunerating the services of Clergymen, of denominations, corresponding with the preference of the contributors. Small contributions would suffice, and the arrangement would become more & more efficient & adequate, as the Students become more numerous; whilst being altogether voluntary, it would interfere neither with the characteristic peculiarity of the University, the consecrated principle of the law, nor the spirit of the Country. Contrary to Barton’s claim, Madison did not make an announcement in 1828 that permanent provision for religious worship would be made by clergymen. Instead, he told one of the university board members his hope that parents and students would voluntarily secure clergymen to provide religious services if so desired by the parents and students. Indeed, reading the entire letter, Madison’s view was that such instruction should come in this voluntary manner rather than having it come via the hiring of members of the clergy to teach.vii Such an arrangement would preserve the independence of the school from religious entanglements and disputes while respecting the free exercise of religion. Barton’s selective quotation of a primary source obscures Madison’s meaning and adds a revised one he apparently prefers. I hope it is obvious that the import of this is not about when UVA had chaplains. It is about credibility and what appears to be an intent to mislead people. I have images of the Globe newspaper Barton referred to. Barton touts his original documents but I haven’t found anything yet that I can’t get via an historical data base. The letter was in an 1837 edition but wasn’t an ad to get students to come to UVA. To read the segment on chaplains at UVA, click Did the University of Virginia Have Chaplains? Getting Jefferson Right by Warren Throckmorton and Michael Coulter stands up for truth in scholarship against the scholarly problems found in David Barton’s ‘The Jefferson’s Lies.’ Because of the courage of Throckmorton and Coulter, Barton has regrettably fallen from his pedestal of preeminence as a scholar of the early American era. Throckmorton and Coulter deserve the ‘Medal of Honor’ for courage and probity. -Chuck Dunn, Distinguished Professor of Government. Regent University. Author and/or Editor of 20 books on American politics, including The Seven Laws of Presidential Leadership and American Culture in Peril. In GETTING JEFFERSON RIGHT, Coulter and Throckmorton prove beyond doubt that Barton is no more scrupulous about the facts of American history than the “revisionists” whose work he pretends to correct. The authors have performed a valuable service. Getting Jefferson Right is an intellectual and historical take down of David Barton’s pseudo-history of Thomas Jefferson by two Christian professors who teach at a conservative Christian college. Michael Coulter and Warren Throckmorton have done their homework. Anyone who reads this book must come to grips with the untruths and suspect historical interpretations that Barton regularly peddles in his books, speaking engagements, and on his radio program. I have yet to read a more thorough refutation of Barton’s claims. I cannot overemphasize the importance of reading Getting Jefferson Right, by Warren Throckmorton and Michael Coulter. 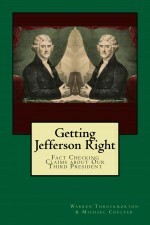 It is a point-counterpoint to David Barton's, aptly titled, The Jefferson Lies; and, it corrects every myth that Barton presents. Every evangelical pastor in America, especially African-American pastors, needs to not only read, but also study the facts in Getting Jefferson Right. For too many years, David Barton has misled pastors across America and this book is the perfect tool to help bring us back to the true, undiluted life of Thomas Jefferson. Christians are rightly distressed when American history is purged of its religious elements. But that's no excuse for us to reconstruct the views of Founders such as Thomas Jefferson according to our likeness. In Getting Jefferson Right, Warren Throckmorton and Michael Coulter have done all of us a great service by exposing, carefully and dispassionately, so many of the popular distortions and half-truths about Jefferson. In the process, they have modeled how to deal with historical texts honestly. If you are interested in learning about the real Jefferson, you owe it to yourself to read this book. Getting Jefferson Right is an excellent example of the art of historical contextualization, of trying to tell the whole story, not just part of it. For those reasons, the work should become a standard reference. Thomas Jefferson is one of the most revered Presidents in U.S. history. And also one of the most misunderstood. In Getting Jefferson Right, Throckmorton and Coulter confront some of the biggest myths with objective facts. The result is a provocative and informative book that has something to teach everyone.